Faith in Action believes catalyzing the power of people to transform their communities begins with a commitment to and investment in the formation of people. We define formation as the processes and practices in which one learns the art and craft of organizing through the development of knowledge, skills and judgement in order to enact justice in our communities. It is both an individual and communal journey of self discovery, curiosity and development fit within the context of faith, power and love. Formation is a dual endeavor of being shaped by others while also being willing to shape those around you through the intersection of race, gender, class, orientation and spiritualities. Therefore, all of our training and development are grounded in our beliefs about formation. An example of this is our leadership training offered for clergy and lay leaders. Leadership training is offered in national and regional formats. We offer National Leadership Training twice a year, in which we convene clergy and leaders from our federations across the country to learn essential organizing principles and practices. Moreover, using the same curriculum we offer Regional Leadership Training throughout the country. Regional Leadership Training is designed reduce costs of national training and be more accessible for clergy and leaders to encourage more people to attend. Here’s a calendar of our leadership trainings for the year. Clergy and leaders will be able to form a bold analysis of systemic racial injustice intersected by economic class and gender and how organizing will challenge those dominant narratives. Clergy and leaders will understand power and be able to build and wield it through the fundamentals of organizing. Clergy and leaders will be able to tell their individual and collective story in ways that challenge the dominant narrative and builds the leadership of the individual and the organization. Clergy and leaderswill be able to build powerful personal and public relationships across faith, race and class lines. Clergy and leaders will be able to build structures, develop strategies and participate in actions and campaigns that channel power. 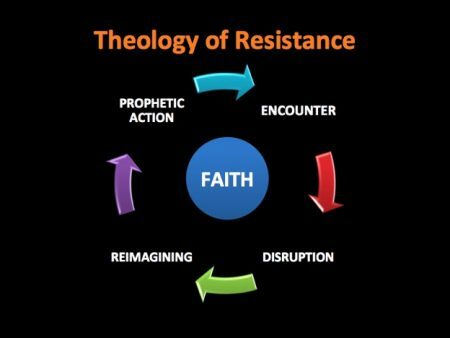 Central to leadership training is Faith in Action’s organizing model which is expressed through the Theology of Resistance. Clergy and leaders will explore the dimensions of encounter, disruption, re-imagination and prophetic action and how that forms the basis for grounding their knowledge, skills and judgment to organize their communities.